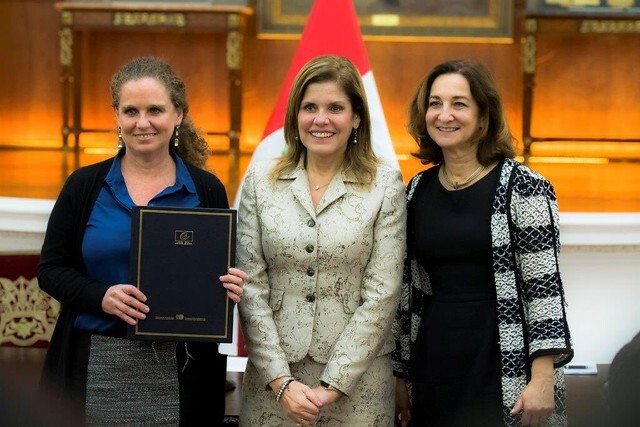 25/10/2017 – Today, in Lima (Peru), Claudia María Amelia Teresa Cooper Fort, Minister of Economy and Finance of Peru, signed the Multilateral Convention on Mutual Administrative Assistance in Tax Matters in the presence of the Deputy Director of the OECD's Centre for Tax Policy and Administration, Grace Perez-Navarro. The Republic of Peru is the 114th jurisdiction to join the Convention, and the 12th Latin American jurisdiction to do so. The Convention is an instrument for international tax co-operation that was developed jointly by the OECD and the Council of Europe in 1988 and amended in 2010 to respond to the call by the G20 to align it to the international standard on exchange of information. The Convention provides all forms of administrative assistance in tax matters: exchange of information on request, spontaneous exchange, automatic exchange (including pursuant to the OECD/G20 Standard for Automatic Exchange of Financial Account Information in Tax Matters), tax examinations abroad, simultaneous tax examinations and assistance in tax collection. It guarantees extensive safeguards for the protection of taxpayers' rights. As such, it guarantees extensive safeguards for the protection of taxpayers' rights and provides a legal basis for other forms of cross-border tax cooperation, including assistance in the collection of taxes, or the undertaking of joint tax examinations with partner administrations. By signing the Convention today, Peru strongly reaffirms its commitment to fight international offshore tax avoidance and evasion. The Convention will allow Peru to rapidly expand its network of information exchange partners and to swiftly implement the transparency measures of the OECD/G20 Base Erosion and Profit Shifting (BEPS) Project , in particular the automatic exchange of Country-by-Country reports under Action 13, which we intend to start as from next year. Media queries should be directed to Pascal Saint-Amans (+33 6 26 30 49 23), Director of the OECD Centre for Tax Policy and Administration (CTPA) or Grace Perez-Navarro (+33 1 45 24 18 80), Deputy Director of the OECD CTPA.